If you’re looking for two bonus reasons to pick up HTC’s newest One S handset on T-Mobile, new YouTube videos highlight two accessories HTC originally launched at Mobile World Congress. HTC Car and HTC Media Link HD accessories enhance your One series multimedia capability allowing wireless integration with a car stereo or HDMI enabled television. HTC Car is a bluetooth adapter which plugs into the AUX port in your vehicle automatically streaming music through your car stereo. If you want to go truly hands-free, you can buy the HTC car dock made specifically for the handset and mount it on the windshield. HTC Media Link HD goes beyond DLNA by enabling full screen mirroring over a wireless connection to any HDMI enabled display. 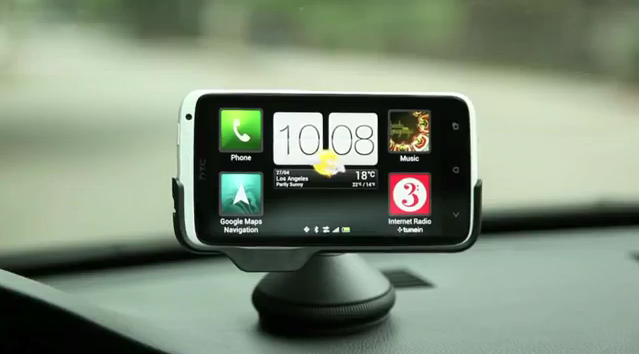 HTC Media Link HD allows you to stream music, movies, presentations, pictures and more with just a swipe of three fingers up on the display on the phone. In order to keep the phone available for use while a movie is streaming, Media LInk HD allows you to press the home button and continue using the device, even making a call while the movie continues to play on the screen. As it stands, neither accessory is available for the T-Mobile One S via T-Mobile’s website — so One S owners can head over to HTC’s official accessory shop to grab either one. they go on sale when? Still not enough reason to buy it. Best Phone on T-Mobile is enough reason to buy it. Nope…the HTC Car has high-quality aptX audio (which the S2 does not have…but the S3 will). There are things the S2 does well…but the One S is the superior device. i know the one s is superior i just meant there’s not much increment from the s2 to the one s.
i wont be picking up this , Sense does not make Sense to me , im skipping to a Galaxy Nexus this thursday!! I’m sorry, but this isn’t enough reason for me to buy the One S. No removable battery, no SD card, and no Beats Audio Headphones? I think I’ll wait for the LG Optimus 4X. It doesn’t have beats, but it has my last two requirements. It’s a good thing it didn’t come with Beats headphones….because I actually like listening to music on quality audio hardware. Little bit off topic….If I buy an unlocked version of the The Samsung Galaxy SIII will it work on t-mobile 4g hspa+….It Should Right?? The unlocked version has a different processor and isn’t compatible with T-mobile’s 4G. My Ford Sync already does that. I got the HTC One S and will be returning it. I will be getting an S3 instead. Problems with the phone include: It seems to just restart itself almost once a day? Bluetooth headsets randomly disconnect. It gets really hot sometimes. Only 9.9gb of free space. Not being able to switch batteries on this device is a huge deal. Rear speaker is poor. Sound was better on my blackberry speaker. Beats is really no big deal. The features of the camera which I like the S3 will also have plus so much more. The S3 will sell many more than both the S and X combined. Yes it is very thin. I would have preferred for it be be slighly thicker with a bigger battery and sd slot. The lack of SD slot on both the S and X will have a huge impact on the number they would have sold.